Clean any dirt or debris from your doors and hardware on a regular basis. Cleaning your doors regularly will ensure that they continue to look beautiful and function properly. Solid wood doors should ideally be wiped down with a soft cloth and Murphy Oil Soap. This will not only clean the door without leaving annoying streaks behind, but it will also polish it and help protect it from the elements. Brass hardware on your door should be cleaned with brass cleaner, and windows should be wiped down with glass cleaner and a soft, lint-free cloth. 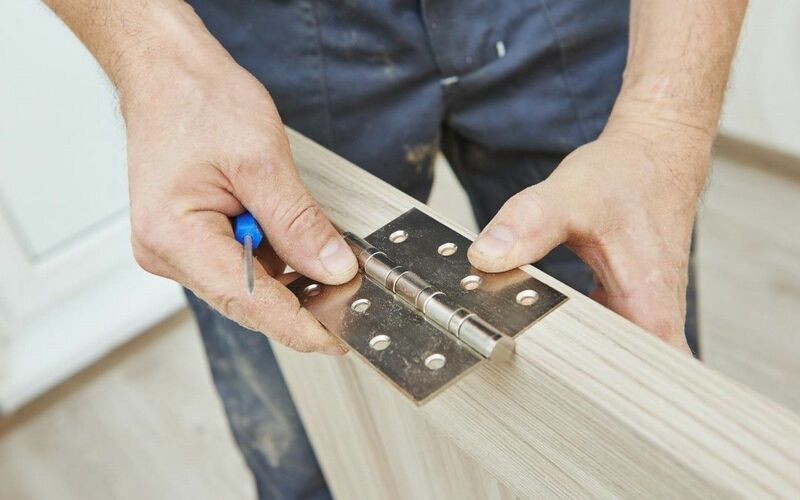 If your door hinges are squeaking or simply not opening as easily as they used to, gently clean them with a damp cloth that has been dipped in a mild solution of soap and water, then apply a small amount of oil to the hinges. You may want to rub the oil around with a cotton swab to ensure that the hinges are sufficiently covered. Wipe away any excess oil with a soft, dry cloth. Replacing your weather stripping any time it gets cracked and damaged will help ensure that vulnerable areas of your door are sufficiently protected from the weather. It will also help keep your cooling and heating costs down by helping to regulate the temperature inside your home. If your weather stripping is dirty, but otherwise looks intact, use a mixture of mild soap and water to clean it. Have you noticed that your wood door is beginning to look faded or old? The good news is that it may just need a fresh layer of paint, finish or stain. In cases of severe wear and tear, you may need to sand the door down to get rid of its rough outer layer before applying new paint or stain. Shop for a New Door! If you have tried everything you can to improve the appearance of your old exterior doors, but they still don’t look the way you want them to, it may be time to shop for replacements. At C.R. Doors and Moulding, we will be happy to help you choose the right exterior doors from our extensive selection. We can even create custom exterior doors that are built exactly to your preferences. To get started, give us a call at (801) 489-1111 or stop by and speak to us in person today!